As many people know, the UK has voted to leave the European Union effective of Friday, 29 March 2019, with a 21-month transition period. There has been a provisional agreement over three issues, most notably budget commitments and EU citizens’ rights, and talks have now moved to agreeing on the future relationship between the UK and EU. 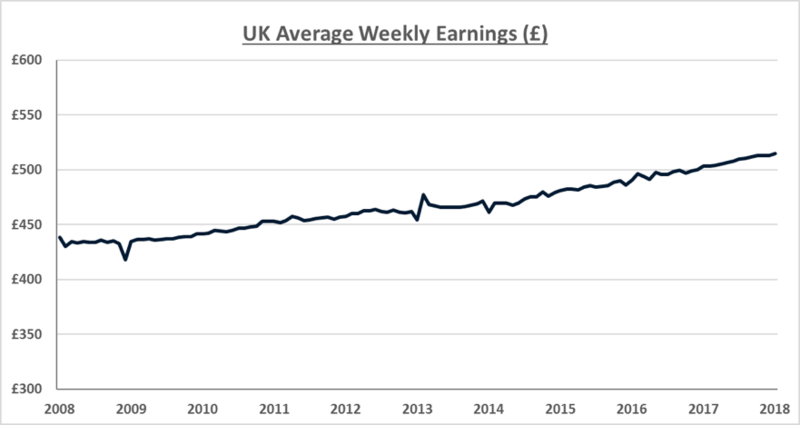 With this relationship yet to be decided, it is difficult to predict what the UK labour market will look like outside of the European Union and the ‘single market,’ which guarantees free movement of goods, capital, services and labour for all members. We are, however, able to examine the current impact that single market access has had on the UK to understand the potential repercussions of a ‘hard exit’ on trade and immigration where no deal is agreed prior to leaving. 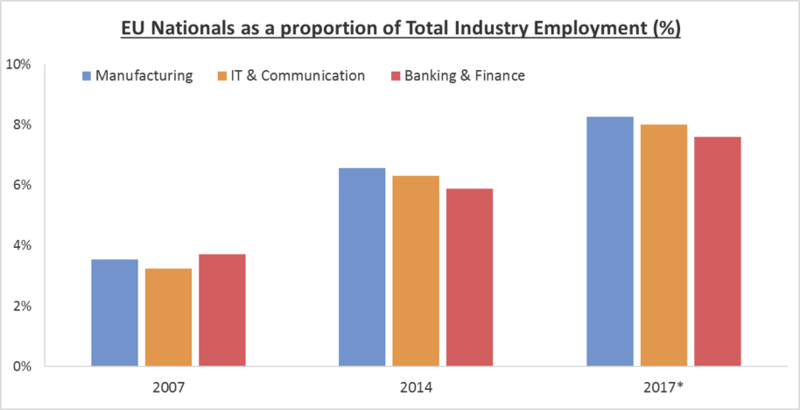 What does the current UK workforce look like? The UK workforce is saturated with EU workers, a result of EU freedom of movement, which equated to 7.3 percent of all UK employment in 2017. Breaking this down by industry and occupations there are some notable trends. Almost one-third of EU workers employed in the UK sit within the top-three skilled occupational groups (managers, professionals and associate professionals). Looking at the different industries, large proportions of EU workers exist in highly skilled industries such as IT and banking, as well as in lower skilled industries such as manufacturing. Over the past decade, the number of EU workers employed in the UK saw a significant increase and based on available data this trend has continued into 2018. *2017 figures are an estimate based on Total Industry Employment and Total EU Nationals Employment data. What impact would a decrease in immigration have? Assuming demand for skilled talent remains at current levels, a decrease in the numbers of EU workers relocating to the UK due to the loss of freedom of movement would lead to a greater shortage of talent and much more competition among employers. With unemployment currently at just 4 percent, and even lower when focusing on the skilled industries and occupations, there is little available talent in the market. This is already leading to high levels of competition and wage inflation, up 2 percent on the year across the in-demand skill sets. Further falls in the availability of skilled talent could cause even greater sourcing challenges and wage inflation. How could Brexit affect international trade? There is a strong chance that Brexit will negatively impact the demand for UK goods and services due to reduced trade with the EU. As of 2017, 45 percent of all UK goods and services exports go to the EU, making it the UK’s largest single trading partner. Unless the UK can negotiate a substantial trade deal with the EU prior to the official leaving date, it is likely that the value of UK exports will fall and in turn, so will the level of demand for British goods and services. As overall demand in an economy falls, there is an equal rise in unemployment as the need for workers to provide goods and services declines. The sector to feel the largest impact from this would likely be manufacturing given that manufacturers accounted for £267 billion in exports during 2017. Assuming that Brexit does have a negative impact on trade, this will lead to a fall in the demand for UK goods and services. As a result, there will be less demand for the inputs used to produce these, namely ‘capital’ and ‘labour.’ Since 2011, the number of job vacancies in manufacturing has grown exponentially – up 44 percent. A shock to demand for goods and services in these industries would see this trend reverse and numbers of job vacancies decline. Over the past 10 years, the UK has come to rely a great deal on the EU, particularly for its supply of skilled labour and demand for UK goods and services exports. If no agreement is determined prior to the hard exit of the UK from the EU, impacts to the UK could be far reaching. On one hand, reduced immigration could create an even greater labour shortage, which would result in increased levels of competition for talent and heavy wage inflation for UK workers. On the other hand, impact to UK exports to the EU could result in a slowdown that would certainly impact manufacturing, but would ultimately reach to other industries as well. 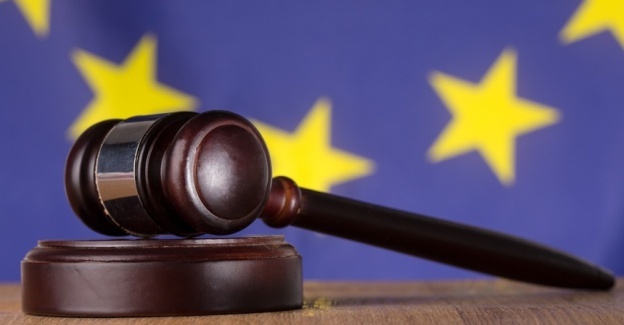 Despite an unknown future, employers who source in the UK can undoubtedly expect to see changes to candidate availability and sector-specific demand over the next few years as the UK adjusts to a world outside of the European Union. Innovation and flexibility in hiring will be of utmost importance as the UK adjusts to its new reality. Alex joined Allegis Global Solutions (AGS) in 2015 as a Research Analyst for EMEA. Prior to this Alex graduated from Coventry University with a Bachelor’s degree in Economics having taken a year’s placement at the Government Economic Service within the Department for Work and Pensions. Here Alex gained invaluable insight into the UK labour market and wider European markets as part of the Labour Market Statistics team. Since joining AGS, Alex has moved to a Senior Analyst role where he holds several responsibilities including: managing contingent workforce rate cards for EMEA based programmes, producing local market analysis for clients across a number of European markets and performing economic analysis to help drive our clients sourcing strategies and workforce planning. Alex also works to produce white papers, blogs, infographics and case studies, all of which speak to a wide variety of issues and trends within AGS programmes or the staffing industry in EMEA.